Huddersfield frustrated us with a physical approach and some blatant time wasting but we eventually found the winner in the 83rd minute to secure a huge win and extend our unbeaten run to 21 games. Leno 6/10 | Had virtually nothing to do in terms of shot stopping. Made a couple of routine catches/clearances. Lichtsteiner 6/10 | Got too involved with the physical Huddersfield players at times which led to a booking. Subbed at half-time as Emery changed formation. Mustafi 6/10 | Solid enough at the back before limping off with a hamstring injury midway through the second half. Will miss the Southampton game anyway due to suspension after being booked for ‘diving’. Sokratis 7.5/10 | Another fine display from the Greek international as he held things together at the back. Unfortunately booked so will miss the Southampton game. Bellerin 6/10 | Not as much of a threat as usual down the right flank. Just couldn’t find any space to work in. Guendouzi 7/10 | Lovely ball in the build-up to the goal. Also set-up Lacazette in the first half which should have led to a goal. Booked for a dive. Xhaka 6/10 | Felt like a bit of a spare part at times as Emery needlessly went with three CM’s. Also booked for diving. 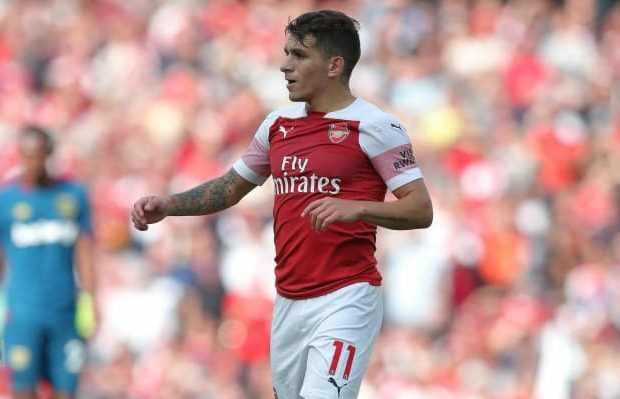 Torreira 8/10 | Another MOTM performance. Forced Lossl in to a fine save with a long range strike and got the vital goal with an acrobatic bicycle kick. Covered the entire pitch yet again. What a signing. Kolasinac 6/10 | Had more joy on the wing than Bellerin but final ball was poor at times. Aubameyang 7/10 | Shot just wide of the post from 8 yards midway through the first half but superb work to set-up Torreira for the goal. Lacazette 5.5/10 | Missed a great chance shortly after Auba’s miss as he blazed over and had another goal wrongly ruled out for offside. Not his afternoon. Subbed at half time. Iwobi 5/10 | On at half time and added some width but wasn’t much of a threat and his touch was off. Struggled to make an impact. Mkhitaryan 6/10 | Some neat touches but couldn’t create anything of note. Monreal 6/10 | Great to see him back on the pitch. It was nowhere near a vintage Arsenal performance but we dug deep to secure a vital three points that puts us up to third in the table ahead of Chelsea and Tottenham’s games this evening. Next up Southampton but I’m not sure we can put out a back three….